I have tried every trick in the book, getting the ingredients to the right temperature, tossing, not stirring, stirring over heat energetically, stirring less, the list is endless. I could not find a method where one did not end up with clumps of cheese. 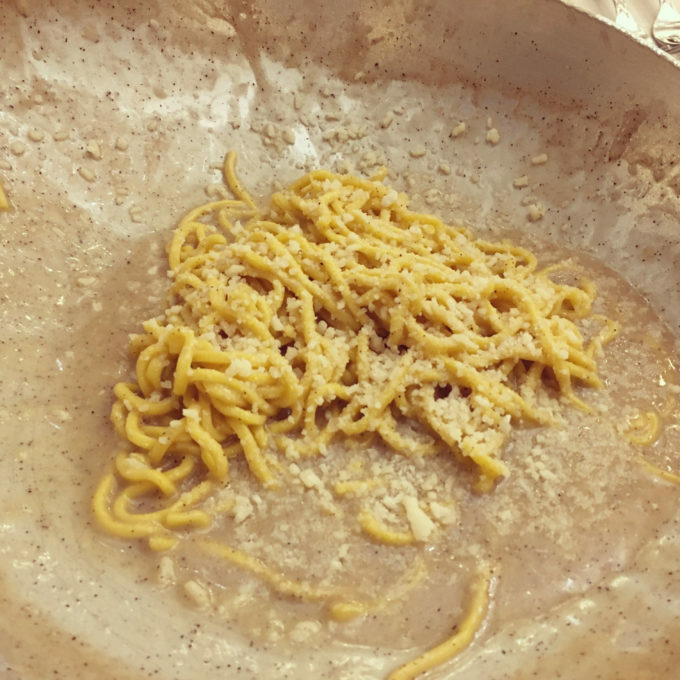 A trip to Rome last year included visits to the famed Taverna Trilussa which dished up Roman classics such as cacio pepe table-side. This offered a front row seat on how to make cacio e pepe the Roman way. Sadly, even this did not result in success for me. 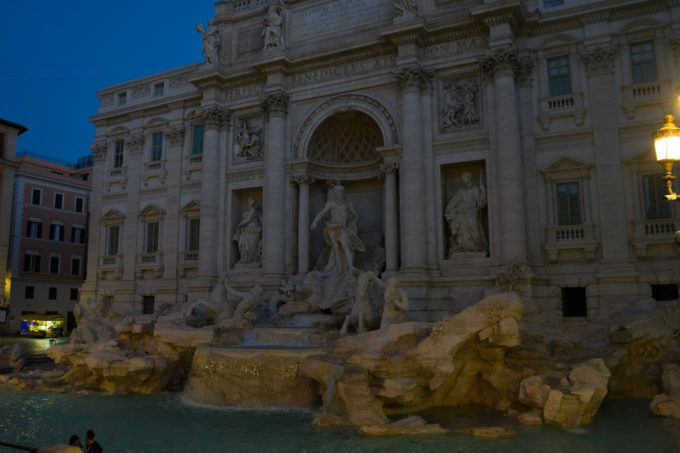 One morning I woke up before dawn to head down to the Campo dei Fiori market, passing the Trevi Fountain at the first hint of dawn. The fountain lit in this light, relatively desolate in these early hours, was a highlight on its own. Continuing on past vendors roasting chestnuts, I was in search of certain companions in these early hours, bakers. I found first Roscioli, living up to its fame with a spectacular selection of hot breads and baked goods. 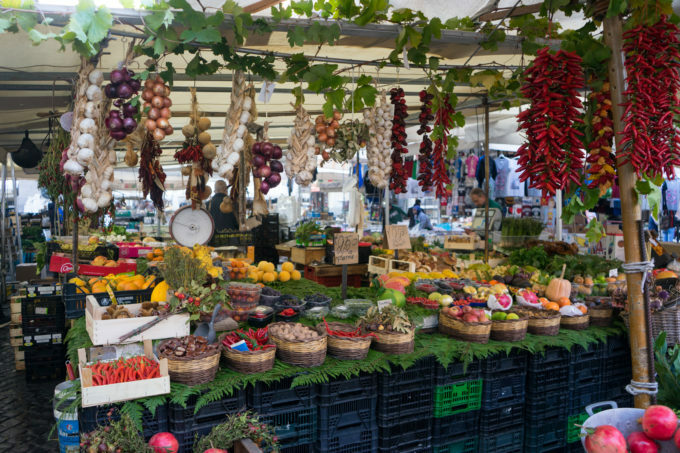 While famous for their Roman pizza (thinner crust than the Neapolitan version), they are also well known for their carbonara and cacio e pepe. 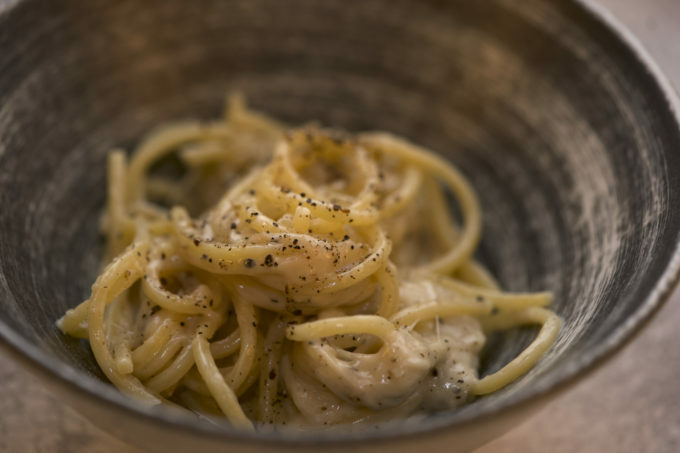 Their method for cacio e pepe (which is also a base they use in their carbonara and amatriciana) was a real eye opener…..and fool proof. It involves a bit of advance preparation of blending tepid water with grated cheese and then refrigerating it but saves all the stress and heartache at serving time when the hope-filled eyes of hungry diners are upon you. Even better, this concoction can live in your fridge for a month, ready for any time a last-minute cacio e pepe, amatriciana or carbonara is required. 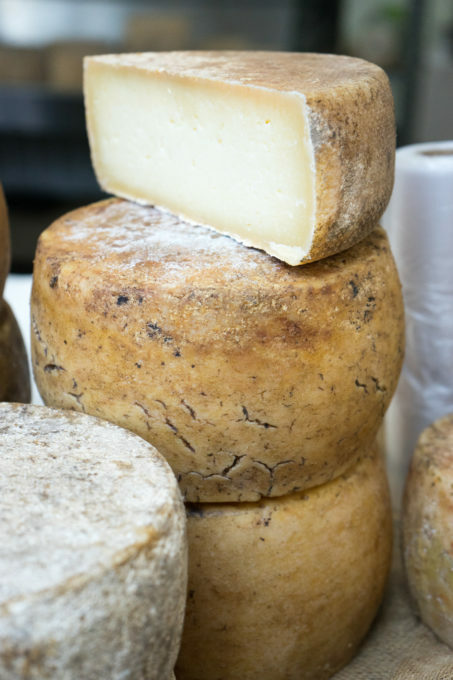 The method here is Roscioli’s but they use a mixture of pecorino and Parmigiano-Reggiano cheeses with different proportions. Traditionally, cacio e pepe is made with only pecorino as it is here. For small children, I serve them the pasta without the pepper and add pepper to the adult portions. For illustrated step-by-step instructions, click here. When ready to eat, heat a large pot with 4 litres of water and 40 grams of salt (the salt will be washed away). Boil the pasta, stirring occasionally to ensure that it does not stick. Do not add oil to the water, the amount of water should ensure the pasta does not stick. Cook for the amount indicated on the pasta packaging minus 5 minutes. Reserve a cup of the pasta cooking water. Drain the pasta and do not rinse. In a cold saute pan, add the drained pasta, the cheese cream and 40 mls of the pasta cooking water, stirring vigorously with a wooden spoon to coat the pasta and using the back of the spoon to smash up any clumps of cheese before it starts to coagulate. Turn the heat on to medium and continue to stirring for 5 minutes. Stir in the black pepper to taste. 6 grams will make it lightly peppery and 10 grams should make it plenty fiery. Serve immediately. Hi Frank! 50% is not so bad. To be honest, my kids LOVE this dish so are happy that I keep trying new ways to get it right. They never care if it clumps even if I get quite frustrated. Thanks for the links. I agree, they do make it look easy. Roscioli’s method IS actually easy though. Let me know what you think when you try it. Wow thank you so much. I was juste like you, failing everytime and ending up with the cheese stringing and clumping, sometimes success but frustratingly random. Now it’s perfect. Thank you. Long live your website. Hello, Glad it worked for you. It’s so nice to find a solution which works every time. Buon appetito!